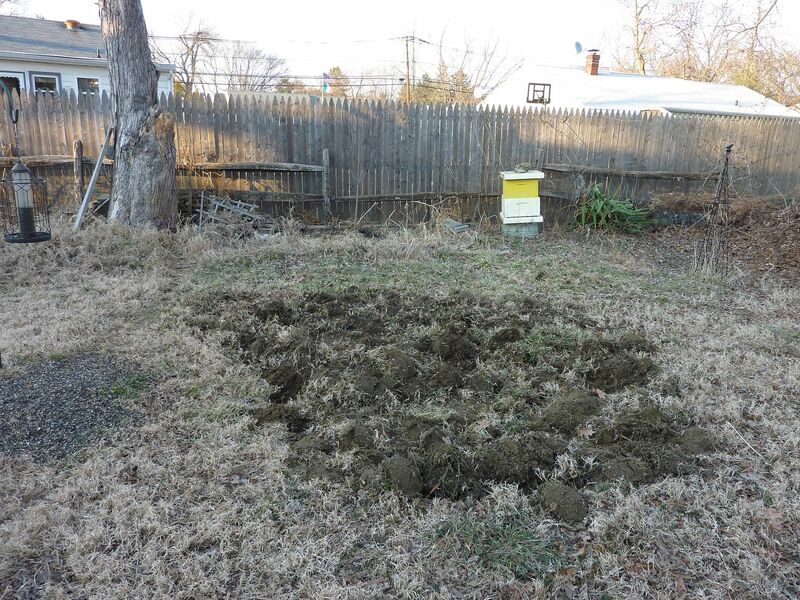 So earlier this year I started a prairie garden, the wrong way. Generally you're supposed to either suffocate or herbicide everything in the desired location for a full year. Had I taken that seriously I might have simply used the space as a vegetable garden with plastic mulch. I have several family members who use this stuff for their gardens and have great results. There is virtually no weeding. As this relates to a prairie garden though I read eliminating everything from the site has to be done in order for most seeds to germinate, and for most seedlings to get through their first year.Another thing I've read is that turning the soil over (like I did) disrupts the seed bank and causes a mass germination of weeds. For both of these reasons I decided to lay down a wood mulch, and rather than using seeds I went with plugs. Plugs are generally plants that have already been growing for a season that typically come in 4' pots. 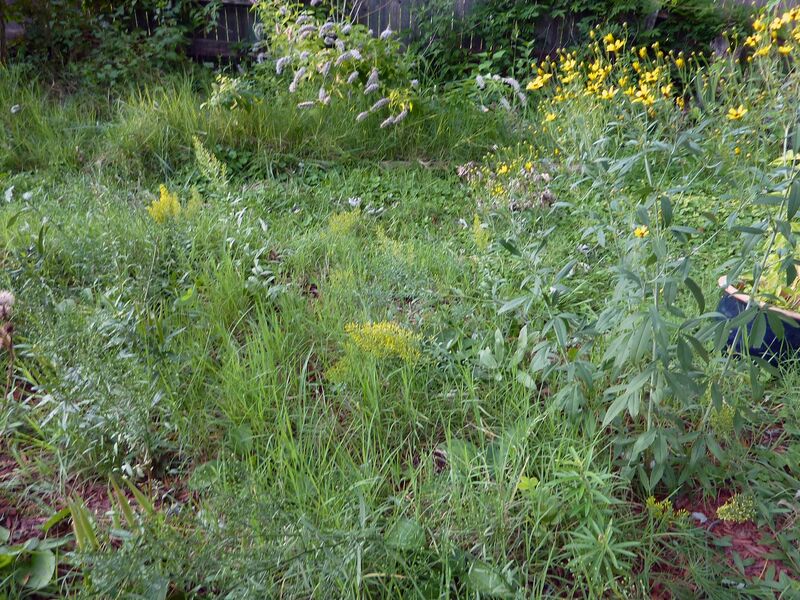 My theory was these plants are more mature and are better able to hold their own against the weeds. Sure enough many of them flowered shortly after planting. 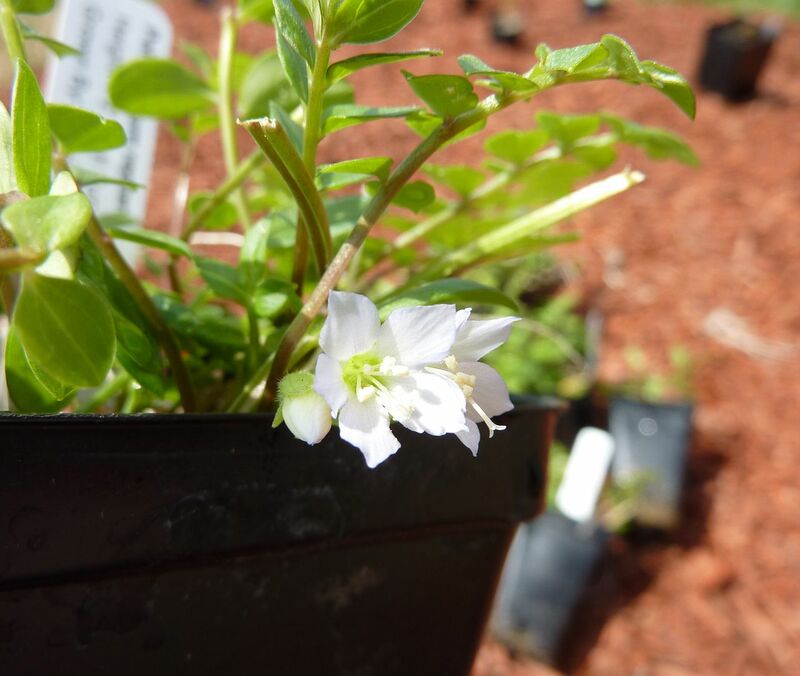 This Jacob's Ladder, Polemonium reptans, above was actually flowering in the pot (also a sign of root stress). 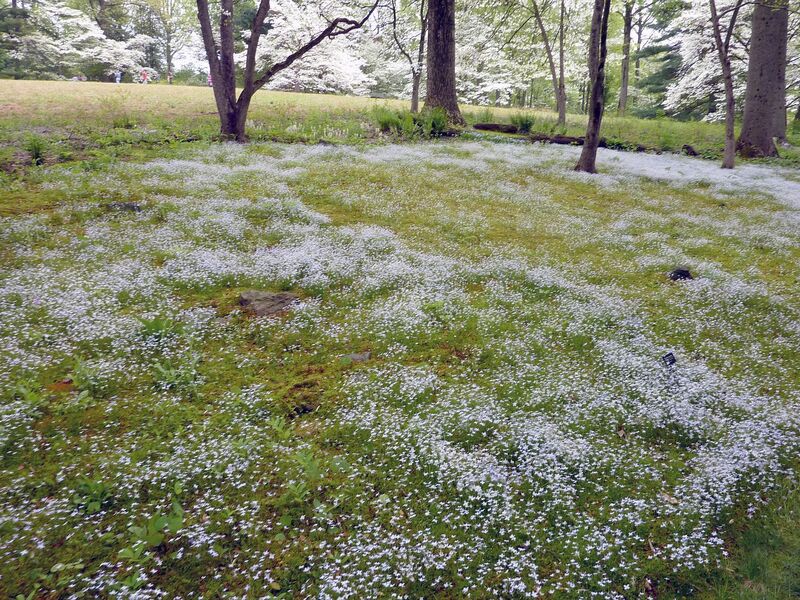 Their flowers actually turn blue with age and when mass planted one almost gets a misty cloud effect. They will grow in full sun, full shade, somewhat dry, to somewhat wet, and there are assorted cultivars with all sorts of foliage options. I went with the true species of course. 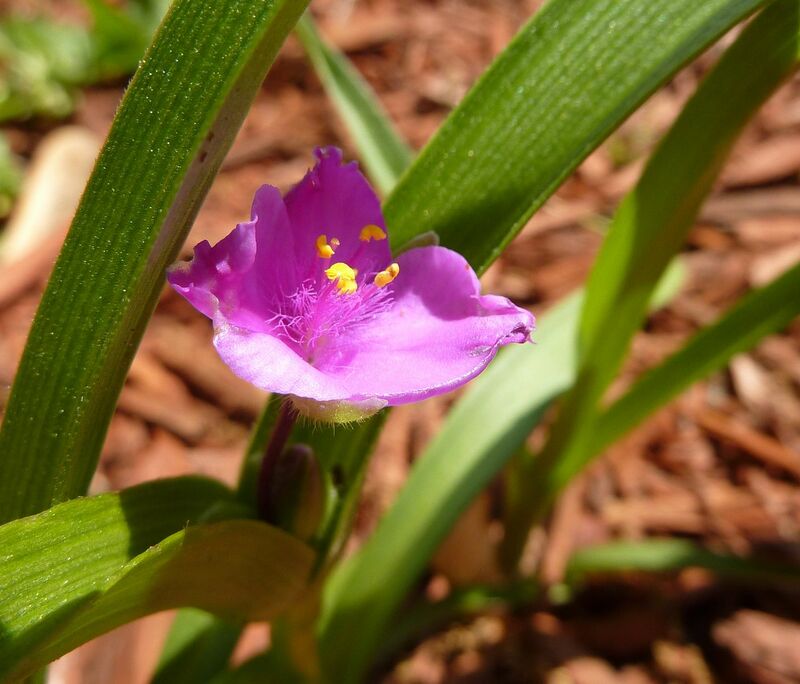 Western Spiderwort, Tradescantia occidentalis, is for whatever reason listed as Native to New Jersey, and New York and otherwise restricted to the western half of the US. I didn't know what to expect with this plant. I needed something grass-like but wanted it to flower too. This was a great choice because I love bright colors. 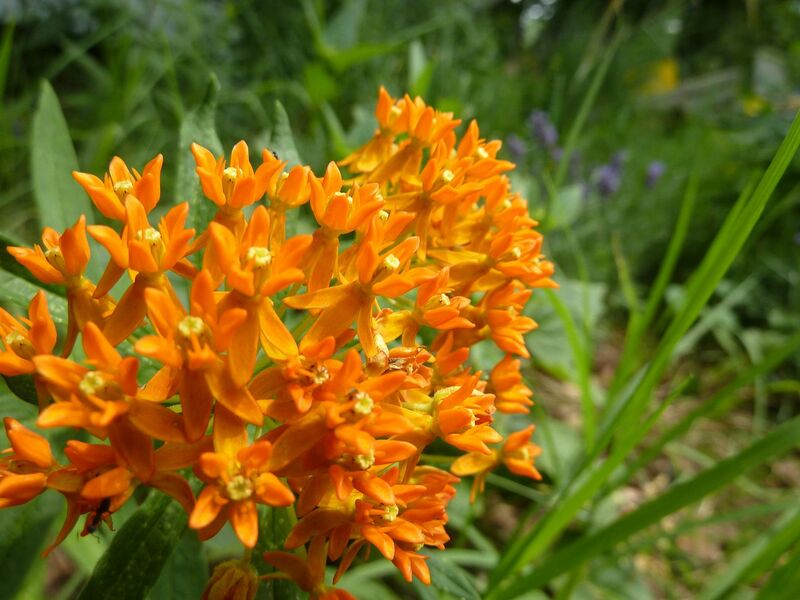 And this sure went with the orange of the Butterfly Weed, Asclepias tuberosa. Things were going nicely at first. Generally the warm season grass that comprises our lawn hadn't taken over yet. 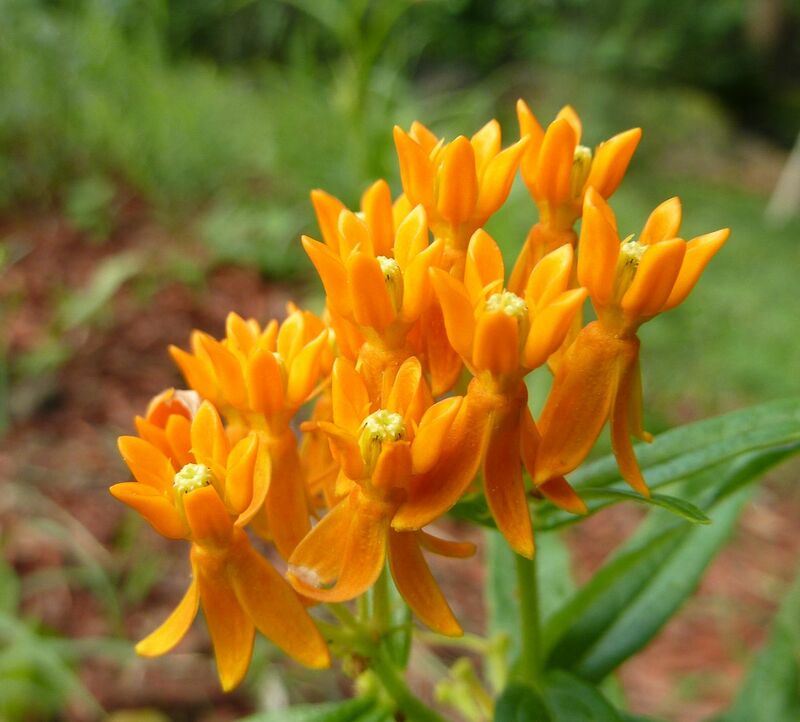 Almost all of the butterfly weed bloomed this year. As summer got into full swing the grasses started encroaching with root tubers. A sunflower from the adjacent bird feeder started growing from seed as well. Behind this garden against the fence I planted a native dogwood, Cornus florida, and found a spot for some Anise Hyssop, Agastache foeniculum, to go. From another angle we can see my solution to all the crap laying around in our yard is to plant gardens in front of them. Actually the glider just needs covers or something on them and it will look nicer. The truck cab in the middle there holds straw under it supposidly for wildlife to live but really I could do without it. We've been stacking old PVC pipe and logs on top of it for convenience. Adjacent Iron Weeds in various gardens started blooming. I noticed this caterpillar that I keep forgetting the name of. Basically they turn the color of whatever type of flower they happen to be eating. I've found them in all sorts of colors. 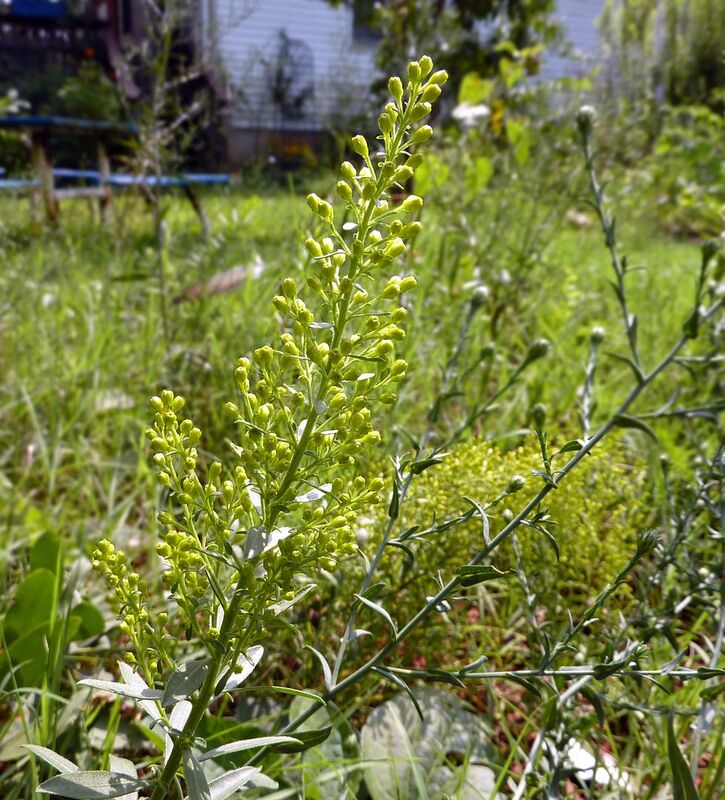 Come August the Showy Goldenrod, Solidago speciosa, started budding. Now I've herd two opinions about this plant. 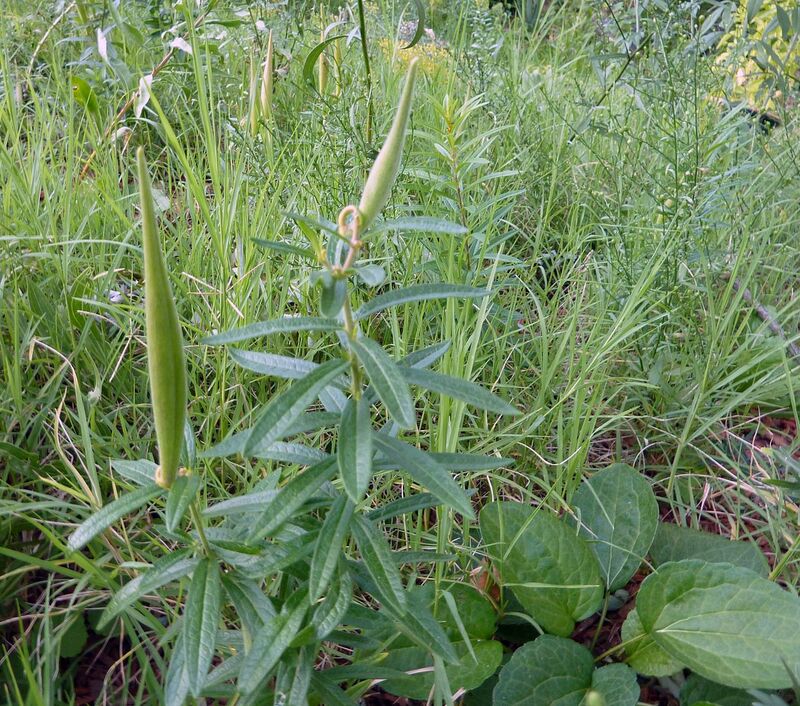 A source in Missouri from the Shaw Nature Preserve says this plant is down right thuggish, and loves to spread everywhere. The guy who maintains the prairie at the Mt. 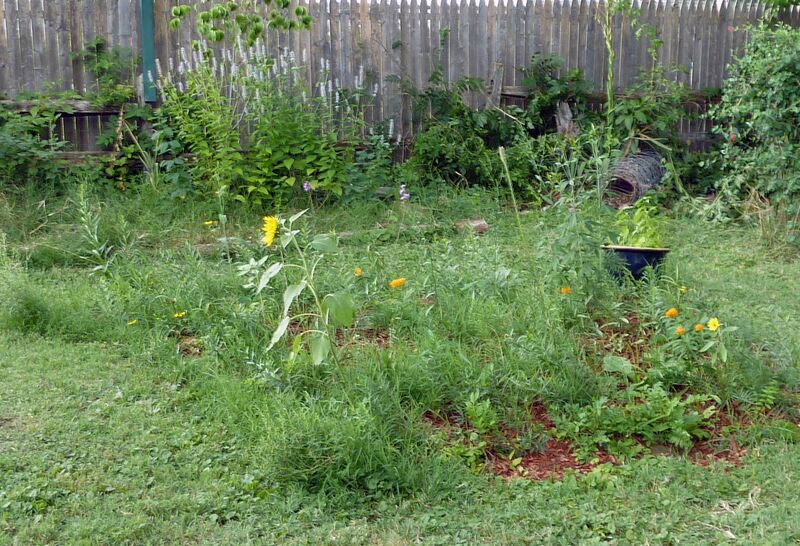 Cuba Center in Delaware says they've grown a few plants there right next to their meadow garden for years and it's never reseeded. So your local variety and how it reacts to your soil type may vary. The Monarchs found the milkweed though I noticed none of the caterpillars in the prairie garden made it to adulthood. I suspect it's due to the lack of cover, and having a bird feeder right next to door sure didn't help. Even though they're toxic to eat, birds and spiders will still take bites out of them until they learn not to do so. You know it's the end of summer when things start falling over. The Showy Goldenrods are pretty much laying down, though it's not entirely displeasing. 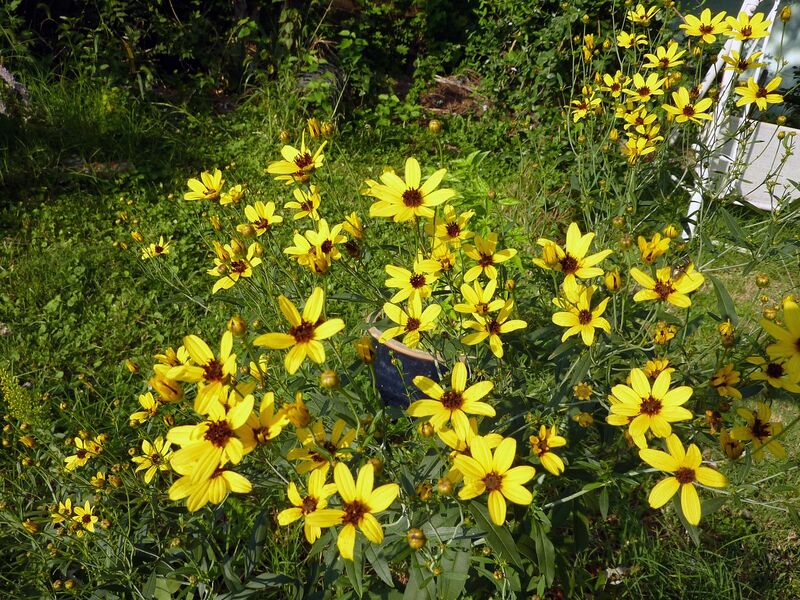 The Tall Coreopsis, Coreopsis tripteris, (at right) did a great job standing up all by itself. I love tall perennials but hate it when they fall over. Here you can see the grass encroaching among the other plants. It's a little tough to pull out of the ground, so hopefully next year I can pull it out just as it starts growing. 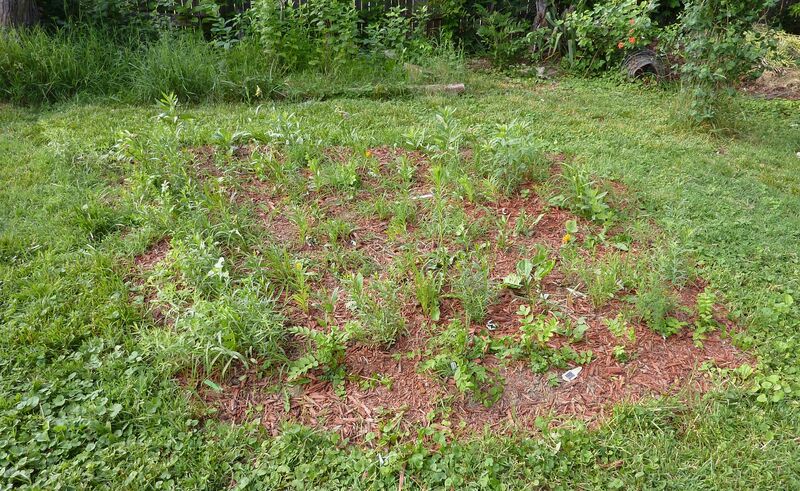 I've noticed some other plants in my other gardens do push that grass right out of their way. So hopefully when things get better established the grass will get shaded out. Here's the tall Coreopsis, though not as tall as it's supposed to get. I read online they grow to be 5' to 8' tall. I learned the hard way that Sky Blue Aster and Smooth Blue Aster look exactly the same. 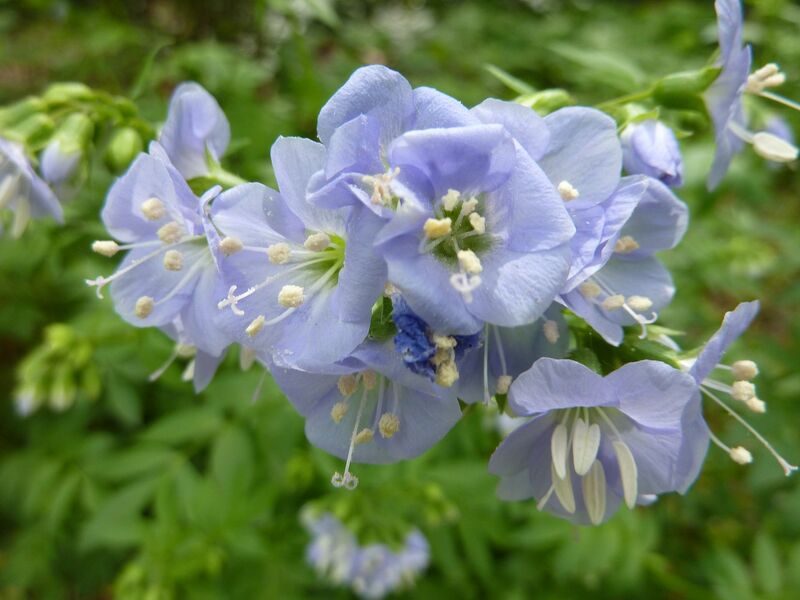 The only difference is Smooth Blue has a slightly larger flower, and Sky Blue has extra leaves around the stem. Neither are distinguishable at a glance. The flower color is exactly the same. (You're looking at Smooth Blue Aster in case you were wondering.) Both are pretty but I don't seen the need to own both. Lace Leaf Coreopsis - grew and flowered but not very well. Stiff Coreopsis - grew but didn't flower. This plant reseeds freely and spreads by root suckers. They're not very big plants but can be a slight problem in mass. Blue Star - Will probably get to big for this spot but we'll see what happens. Blue False Indigo - Will probably get to big for this spot but we'll see what happens. 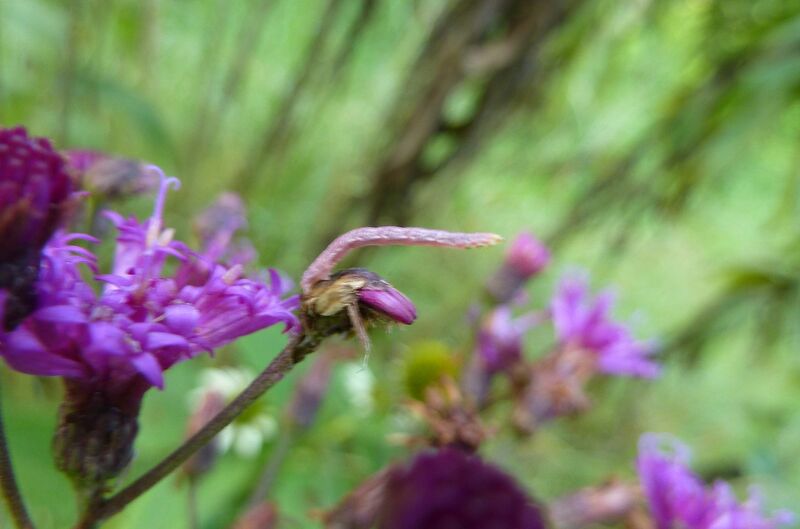 Purple Prairie Clover - Grew, but wildlife kept nibbling off the flower buds before any of them bloomed. Ozark Coneflower - This went dormant right when I planted it. I'm not even sure they'll come back next year. 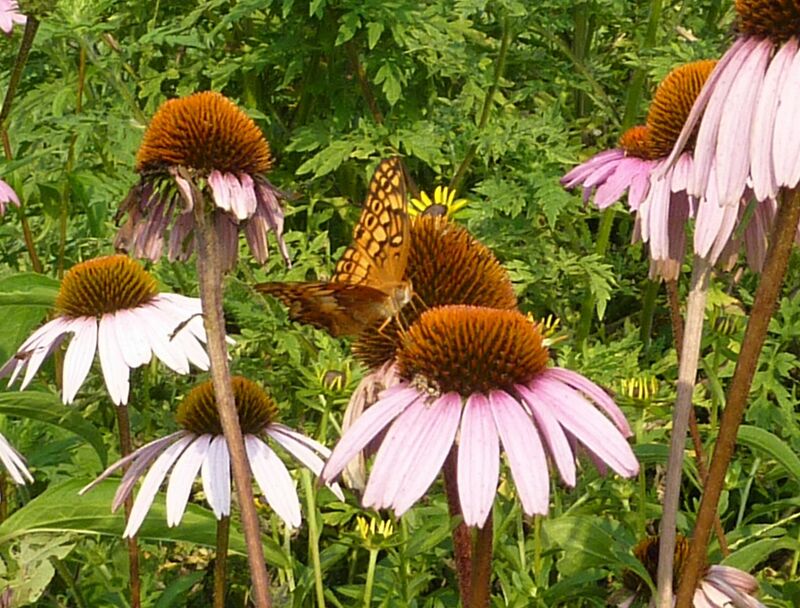 Orange Coneflower - which looks exactly like Black Eyed Susan. Supposedly it's longer lived. Meadow Liatris - Well worth your money if you can grow them. One of the best Monarch nectar plants. Aromatic Aster - More people should grow this for it's natural dome habit. As for the smell they're only slightly fragrant but it's nothing special. To plant more of what works. This catagory is generally reserved for plants and animals that don't fit in the other areas. This past year was a big one for this group as I decided to install a small prairie and visited the Mt. Cuba Center far more often. 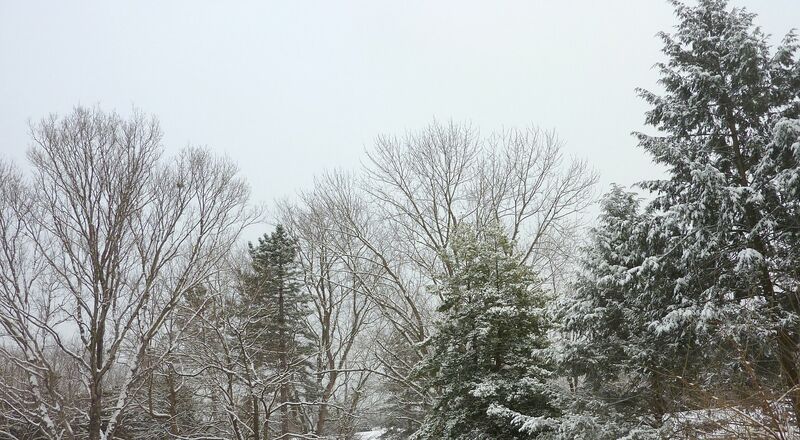 The trees in winter. This is just behind my house. 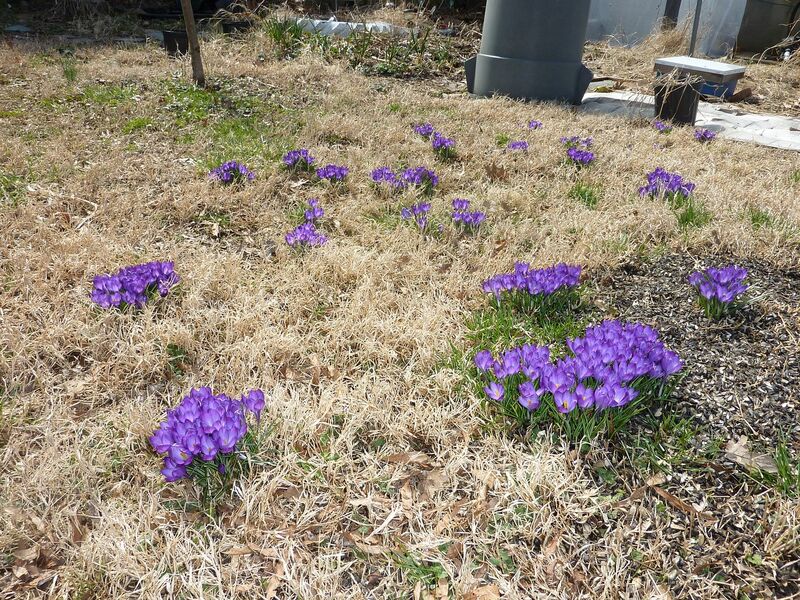 Crocuses in our lawn provide an early splash of color. They do best in the driest parts that are otherwise bone dry over the summer. They're not native to North America and I'm at a loss to name anything flowering when they do that would work well in a lawn setting. Bluets, Hedyotis caerulea, would be a nice choice but this is my first year with them. What they need to grow seems to be questionable. Pictured above is the patch at the Mt. Cuba Center which seem to grow great in partial to full shade among the moss. Other sources tell me they need to be bone dry and in full sun. Regardless, they actually don't do that well in areas where grasses will out compete them. I actually don't know what pollinates them. 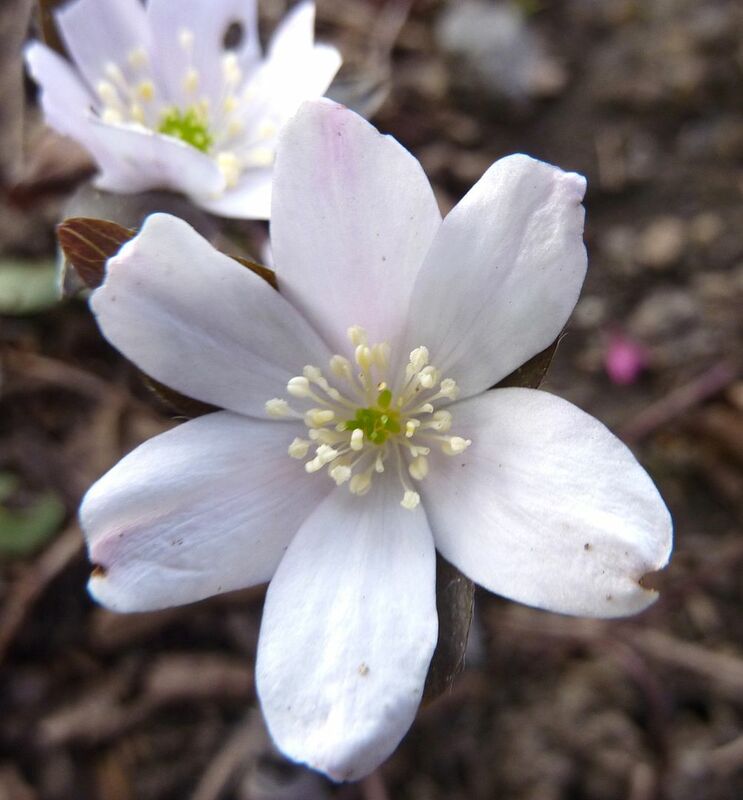 Hepatica is quickly becoming one of my favorite spring blooms. They're kind of like bluets but the flower is larger. They have semi-evergreen foliage too, where new leaves are produced every spring to replace older ones. 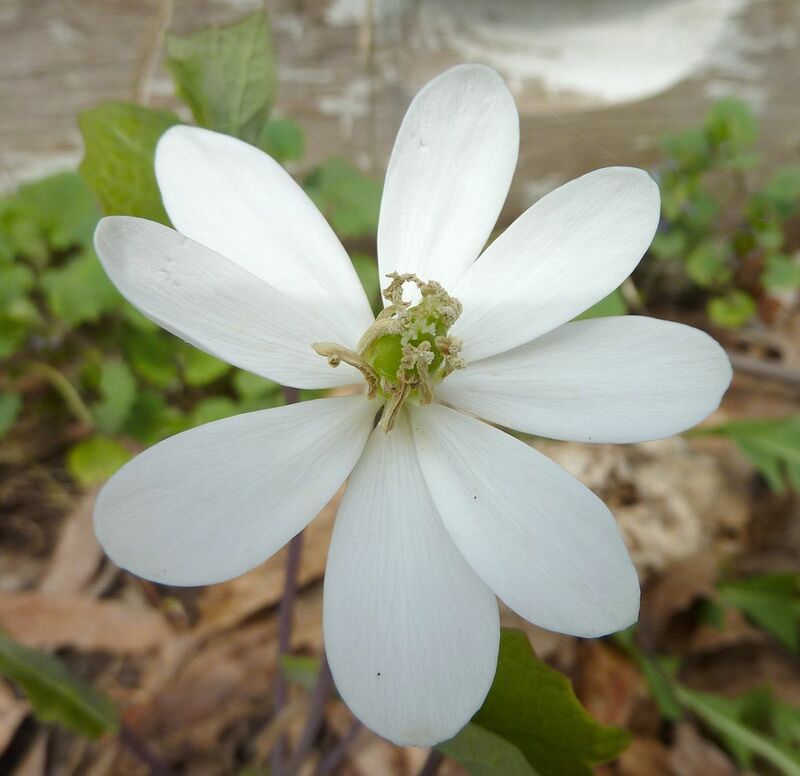 Twinleaf, Jeffersonia diphylla. If I were rich, I'd plant more of these. 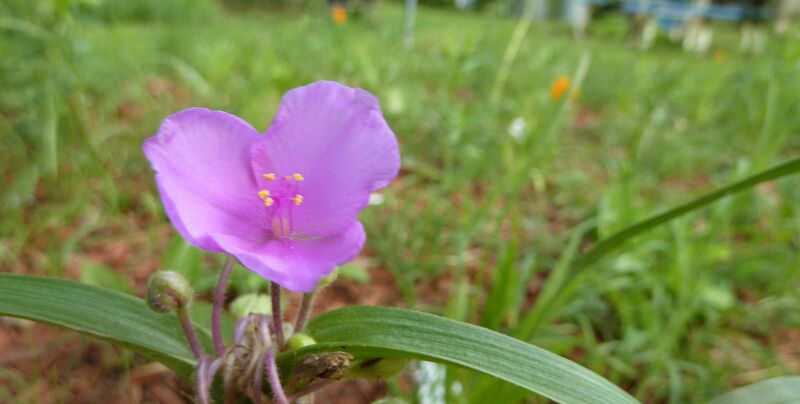 Of three plants only one flowers, and that flower only lasts 8 hours at most. 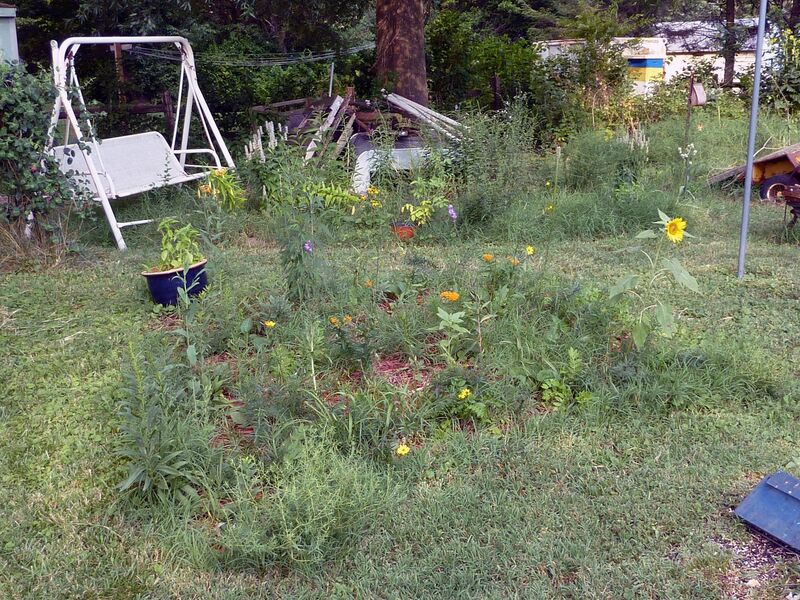 Online pictures show that multiple plants will all flower on the same day so I'd be curious to find out if different patches of these plants would bloom on different days. That is to what degree do they synchronize their bloom? It's pretty for a day but not something I'd recommend starting out. They're really more of a collector's item. 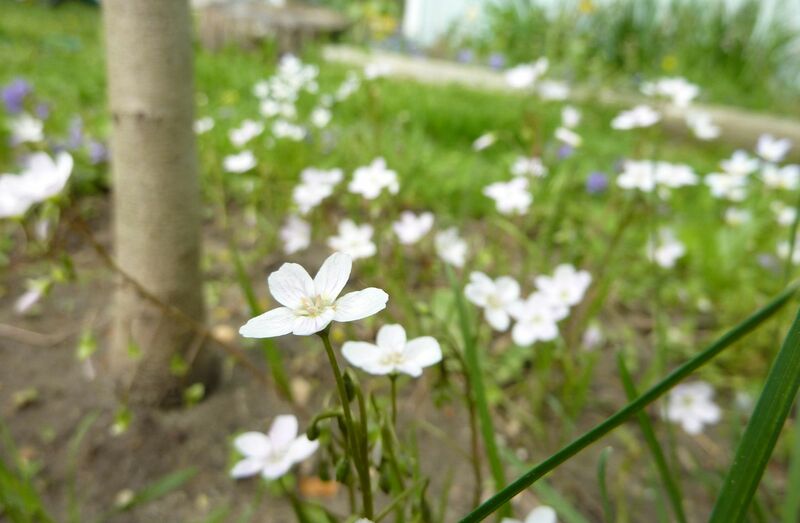 Spring Beauty, Claytonia virginica, flowering among some bluets. They're not as pink as I expected them to be. 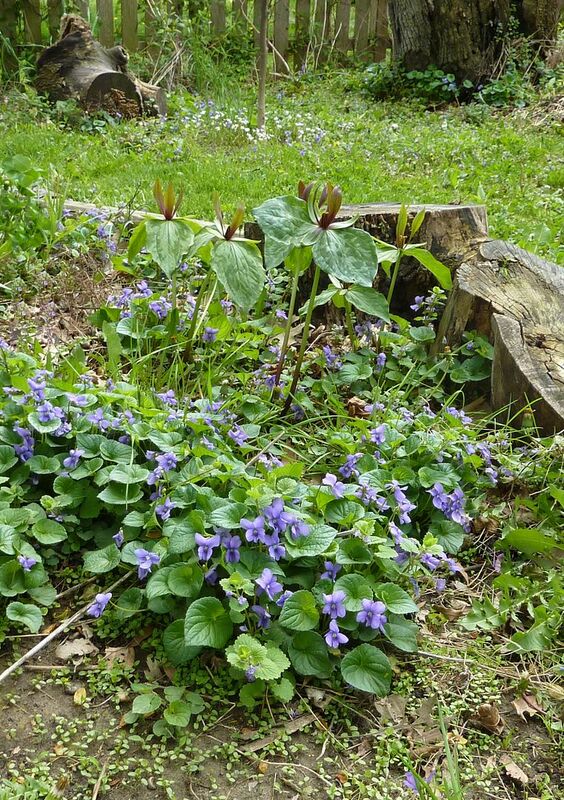 Violets and Trilliums. Violets are supposed to have ants carry their seeds off... clearly the ants aren't doing a good job. All of the small green sprouts in the lower portion of the pictures are violets. Trilliums on the other hand take 5 years before they really get as big. 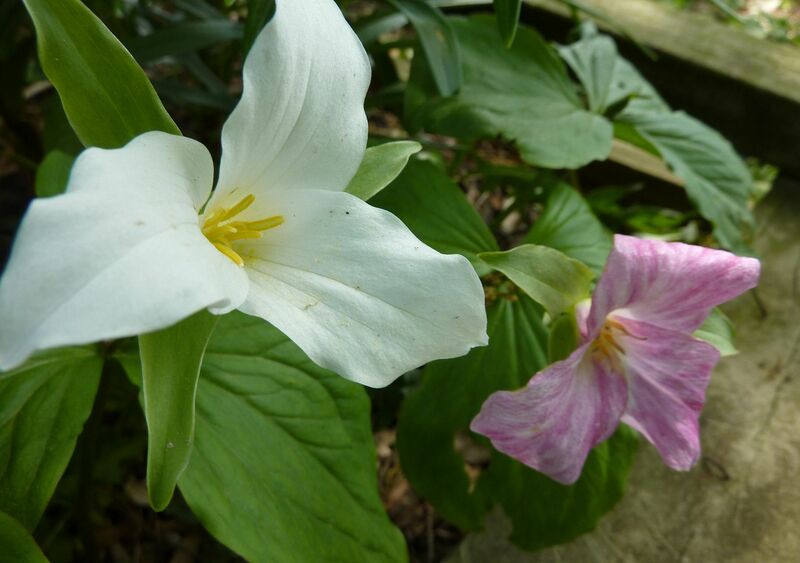 I've found the two can grow well together as most Trilliums are taller than the clumps of violets growing below. 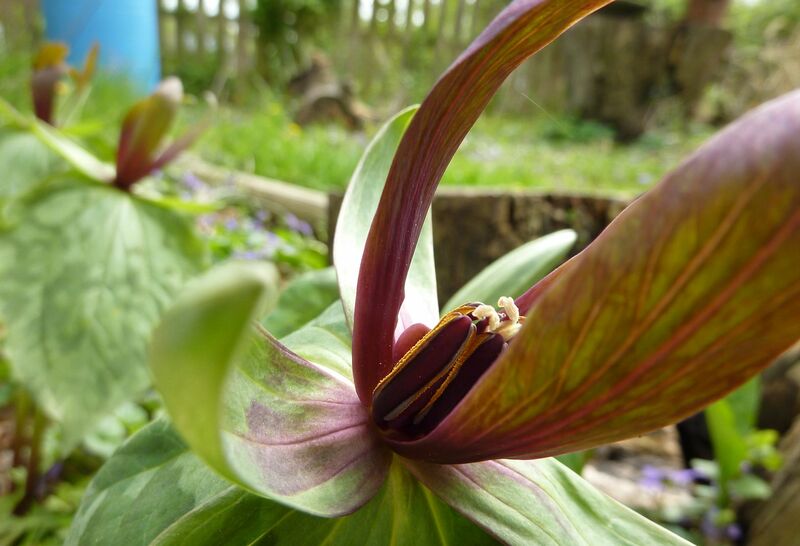 Playing with angles and the Trillium flowers. 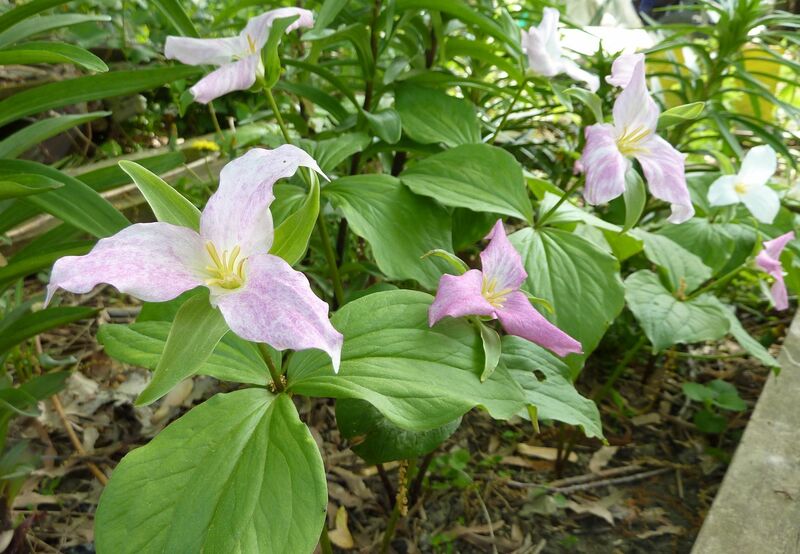 Trillium grandiflorum is an excellent spring ephemeral. For the first week of flowering they are all white. Slowly over the second week, depending on age and pollination, the flowers fade pink and magenta. 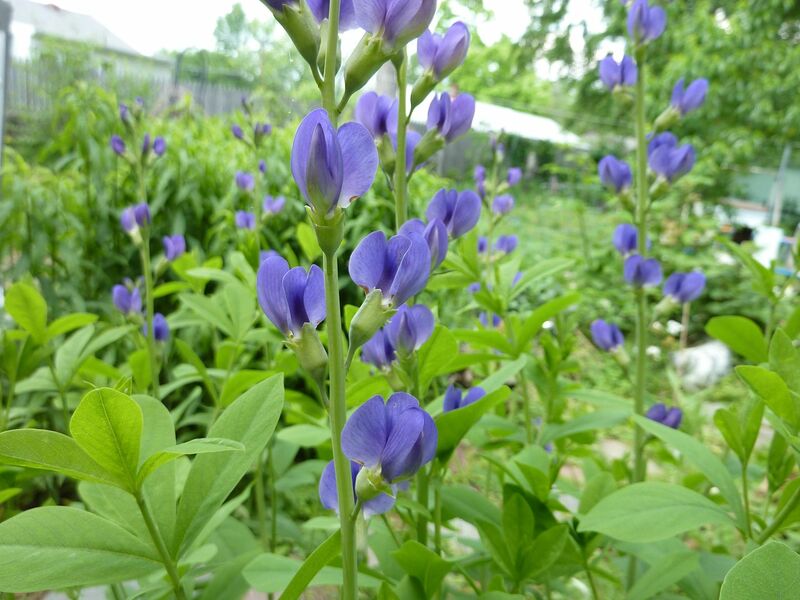 Blue False Indigo, Baptisia australis. This flowered much sooner than I expected it to. The flowers are almost exclusively pollinated by bumblebees. Despite this though they are a very stately plant, good as a hedge, a clump of 3 or more, or specimen. New Jersey Tea, Ceanothus americanus. I have 4 of these small shrubs which are all nowhere near their full size, but I'm happy to see say all of them are flowering this year. 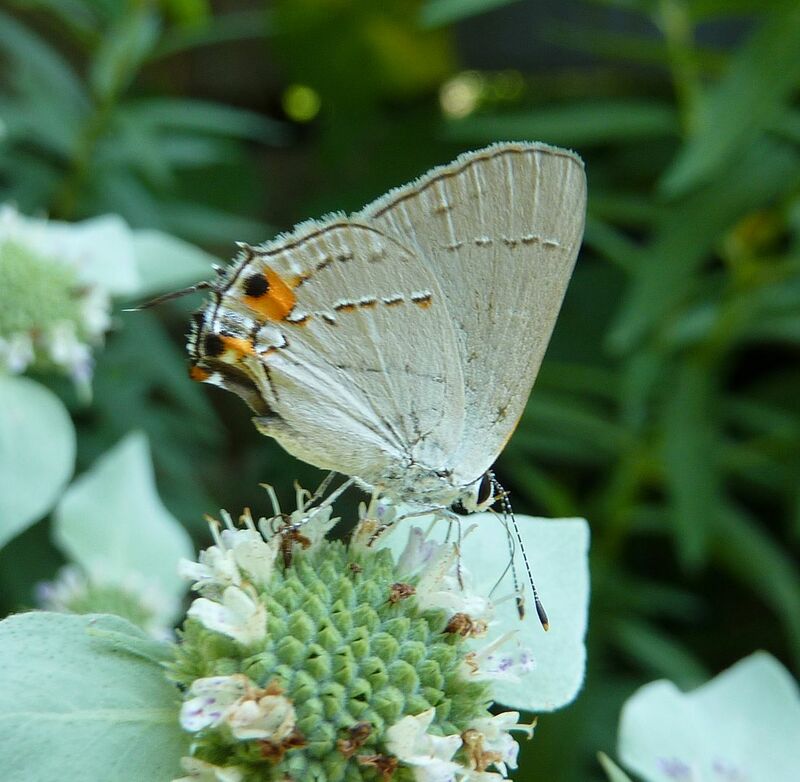 This shrub is in something of a nation wide decline and the range to the dozen or so Lepidoptera that depend on it have been suffering for it. Some of these are endangered species. I encourage anyone willing to give this shrub a try. The flower clusters are small but supposidly buzz with insect activity when in abundance. None of my plants are old enough for that activity yet but hopefully I'll get to see it in years to come. 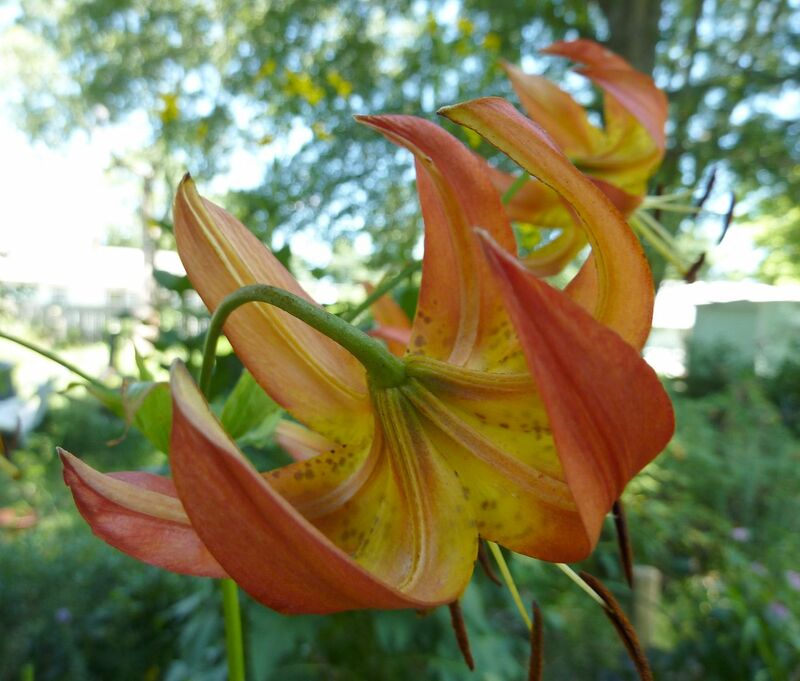 Turk's Cap Lily, Lilium superbum. I'm thrilled to see not only are my plants producing more flowers but they also seem to be reproducing a little. Lilies are one of those weird flowers that require a swallowtail butterfly to hang upside down from them in order to pollinate it. This isn't a common sight so having more flowers increases the chances of it happening while I'm around. 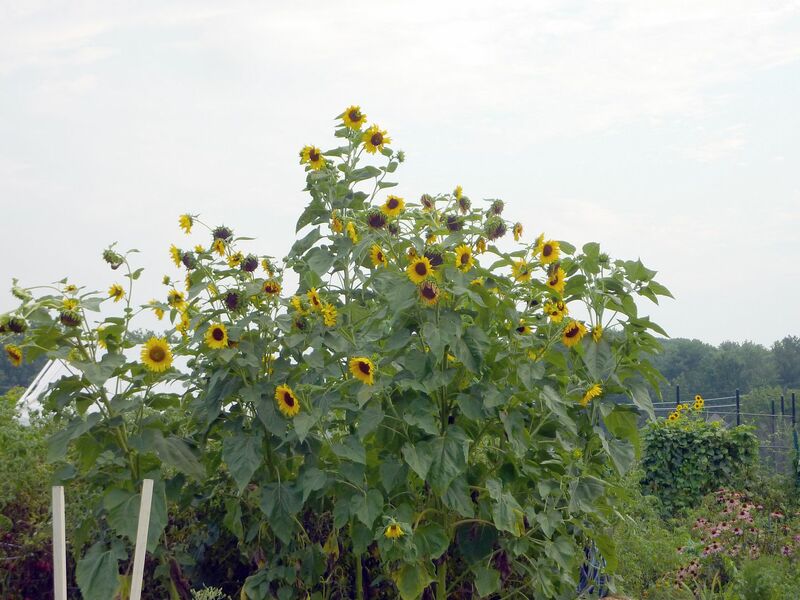 I wasn't very successful with sunflowers this year but at the local community garden they've mastered growing them. Most of these flowers are coming off of 3 or 4 plants. Some of them there had 50 flowers open at a time. The structure looked more like a Christmas tree than your typical annual sunflower. 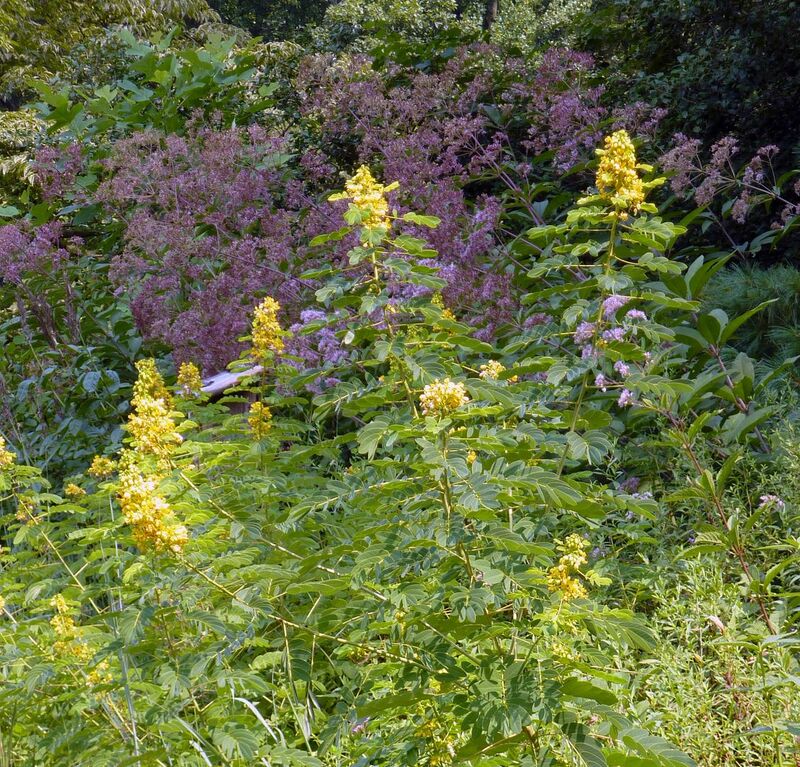 Wild Senna, Senna hebecarpa, growing in front of Joe Pye Weed, which are now in the genus Eutrochium. 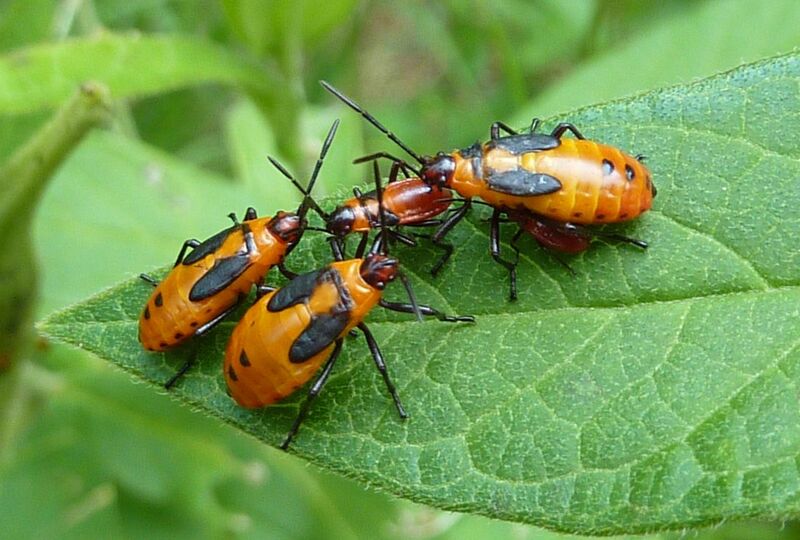 Nymph Milkweed Bugs, Oncopeltus fasciatus, huddling together on their host plant. None of my plants seem to get swarmed the way I see some do. I've seen plants that were overrun with these bugs. It got to the point where they were spilling off onto other plants. Blue Monkshood, Aconitum uncinatum. 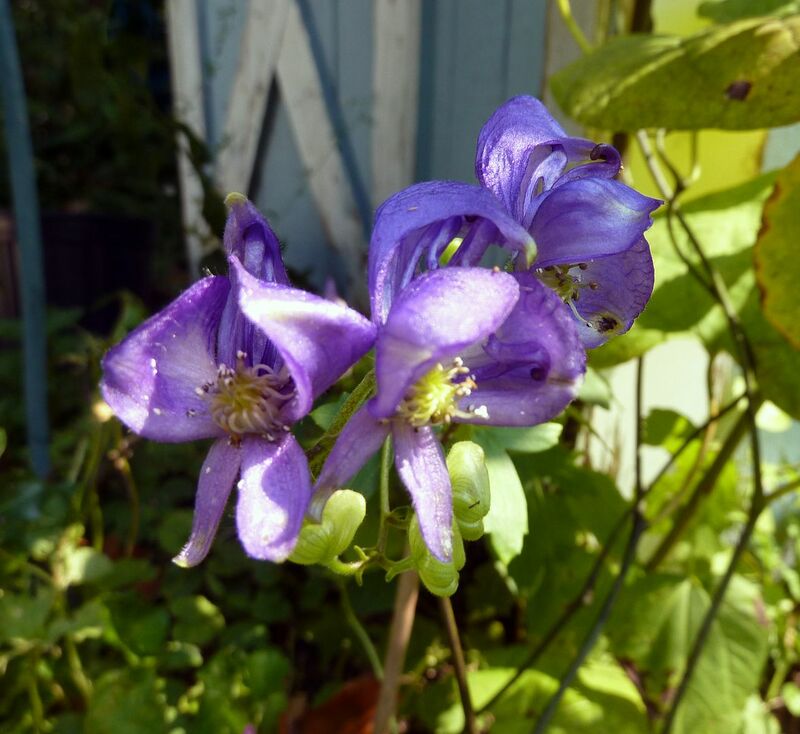 When people think of monkshood usually they think of an upright perennial. North America has a species or two of it's own though. This species in particular grows as a vine that only reaches 5' tall. They die back to the ground each year so they stay in check. In the absence of anything to climb on they'll grow along the ground. They don't set down roots as they like but the rhizome will send up more and more shoots each year as an expanding clump. For most of the year they're nothing special. When they flower in late summer though they have loads of flowers all over. Something I noticed with the Mt. Cuba Center, They seem to be going a little nuts with these plants, along with Bugbanes, Cimicifuga species. There aren't a whole lot of flowering perennials for full shade in the summer months so they are almost stock piling these plants in their wooded area. Personally I'd love to include more of both in my garden. Full sun areas over the summer show a different story. 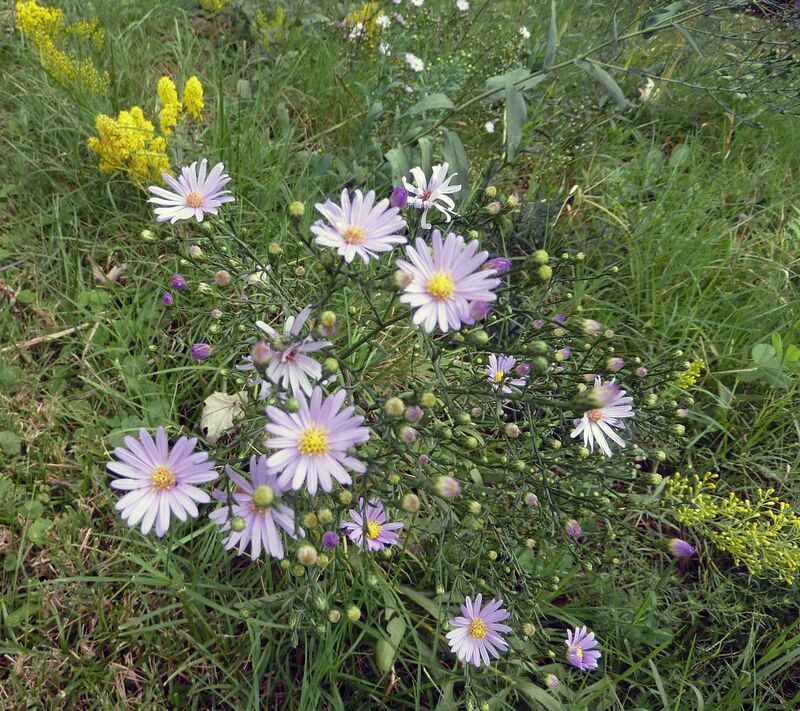 Flowering plants are abundant and in assorted colors. This was a great year for Monarchs as well as Hummingbirds. Both took to the plants I started growing this year nicely. As autumn rolls in the asters bloom out. 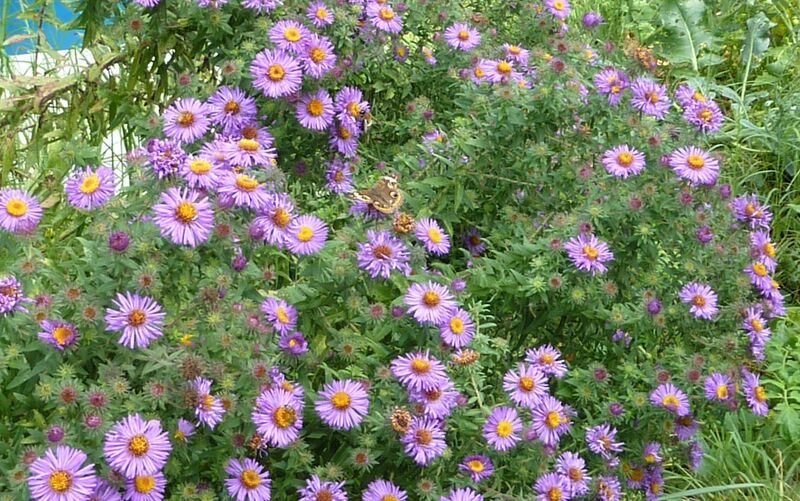 New England Asters, Symphyotrichum novae-angliae, are among the best at getting pollinator activity. 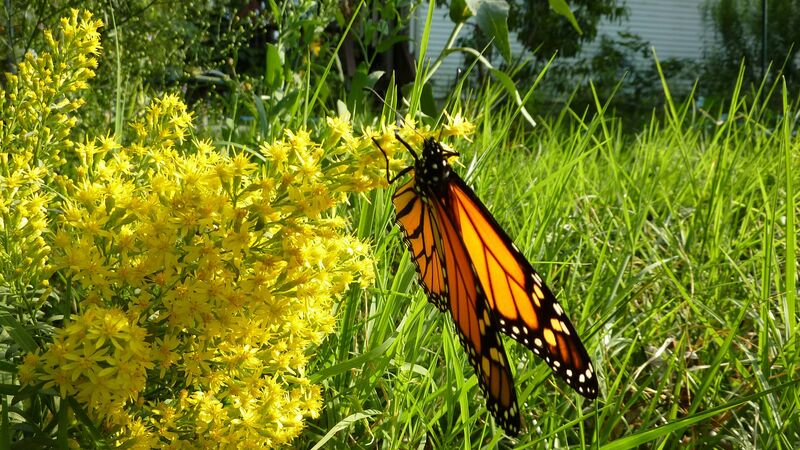 And so is the goldenrod. 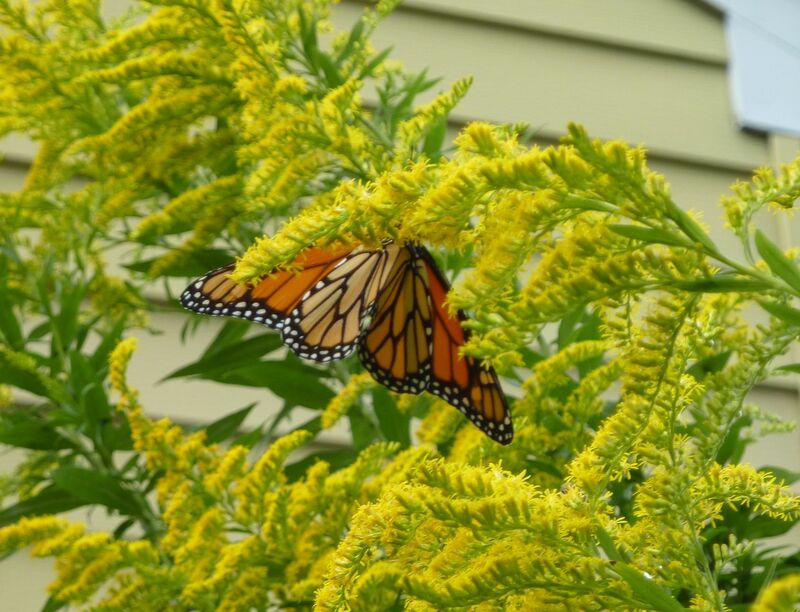 This is the first year I've ever seen a Monarch on my Tall Goldenrod, Solidago altissima. 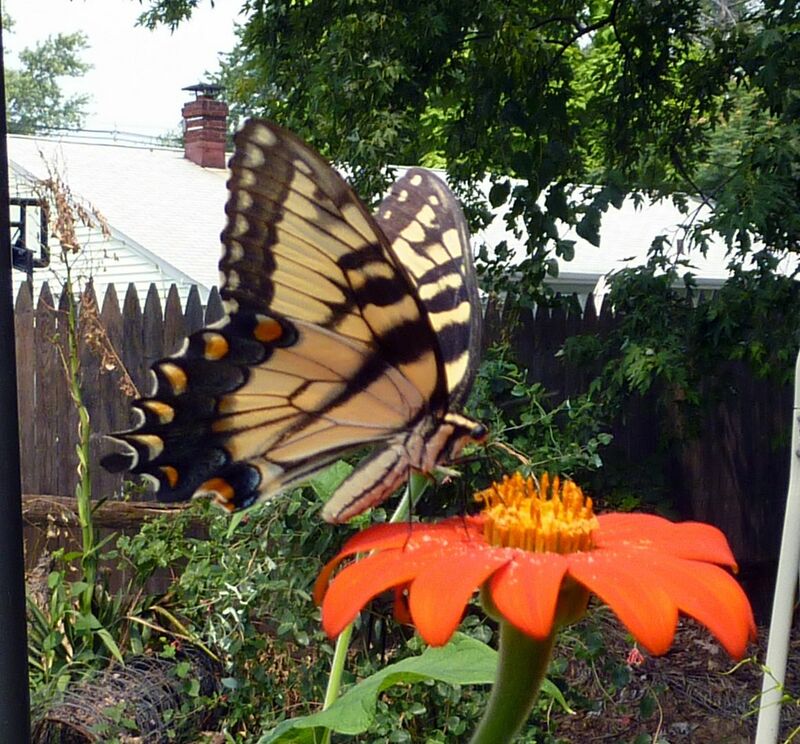 Normally it blooms to late in the year, just after most of the Monarchs have passed through my part of New Jersey. 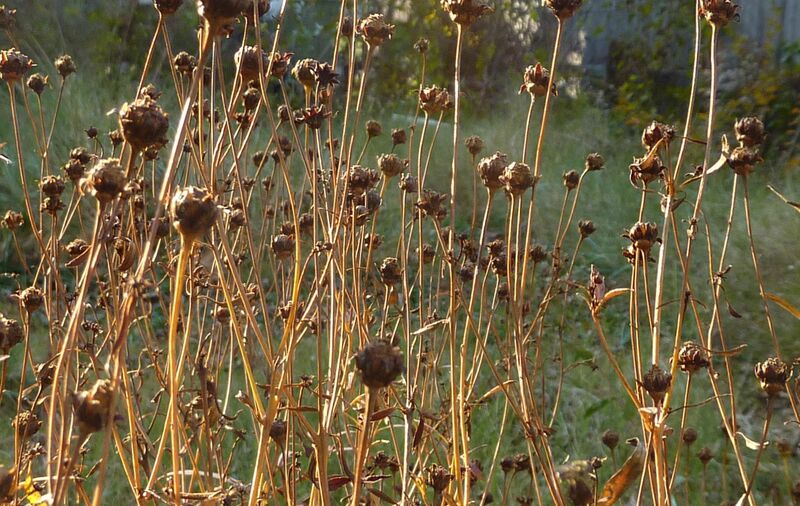 The seed heads to Tall Coreopsis, Coreopsis tripteris. I've been noticing a trend with the Lepidoptera (Moths and Butterflies) in my area. As the flowers all come out each spring we get an assortment of small tent caterpillars. Their mother moth had attached the eggs to the tree the previous autumn. Once they hatch the caterpillars begin nibbling away at the tender new flower petals to mostly fruit trees. At the same time migrations like the Red Admiral, Painted Lady, and American Lady start up, all of whom fly lightning fast and are easy to miss if you're not looking. Eastern Commas and Mourning Cloaks come out of hibernation and flutter about with the newly emerged Swallowtails, of which there are incredibly few at the start of the year. After this initial boom we enter something of a drought with butterflies. This all changes come June, July, and August, as things have gotten into full swing. Generally any butterfly worth its salt will be flying around at this time of year. During the heart of summer they almost completely disappear during the hottest part of the day. Come 4:00pm though they'll be back out in full swing. The Monarch for the most part hasn't had its population explosion yet, so this is really the time when Swallowtails steal the show. 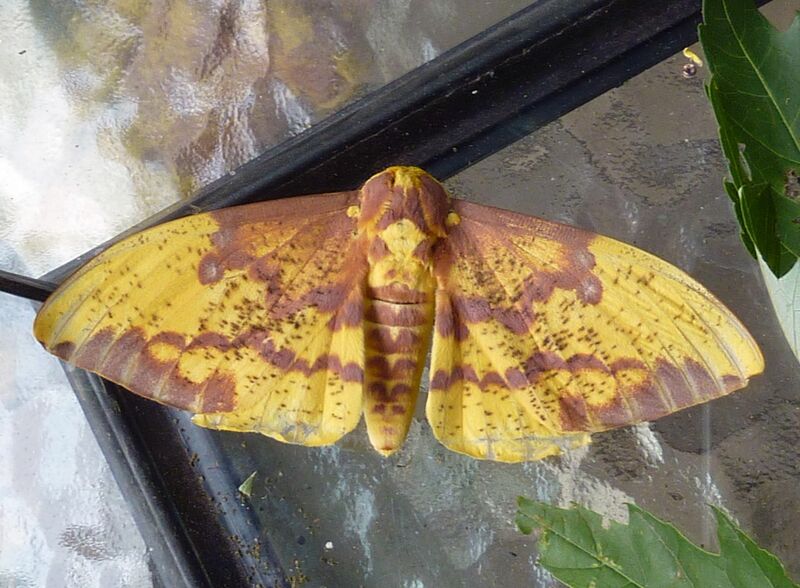 Giant Silk and Royal Moths can be found around lights at night. Once we hit August we're overtaken by orange and black. 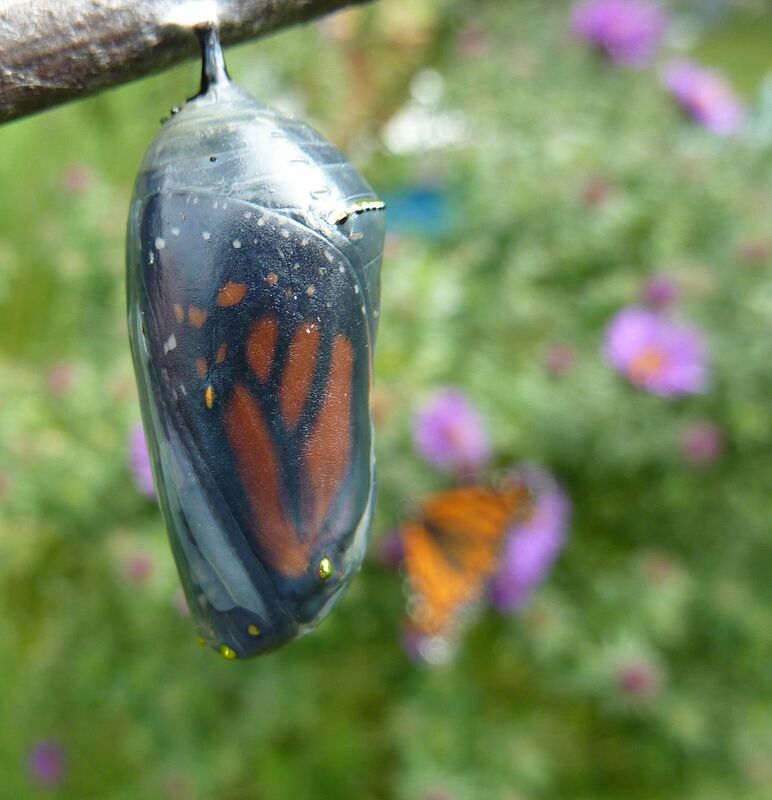 The Monarch population is approaching its peak for the year and their migration south begins. A few others migrate at this time but they're not as well known by the general public. I often feel that the Monarch gets too much attention in butterfly gardens. It really is the only species the general public seems comfortable enough discussing. This is on par with the Honeybee hogging all the spotlight in the "Save the Bees" movement. Monarchs are almost too easy! 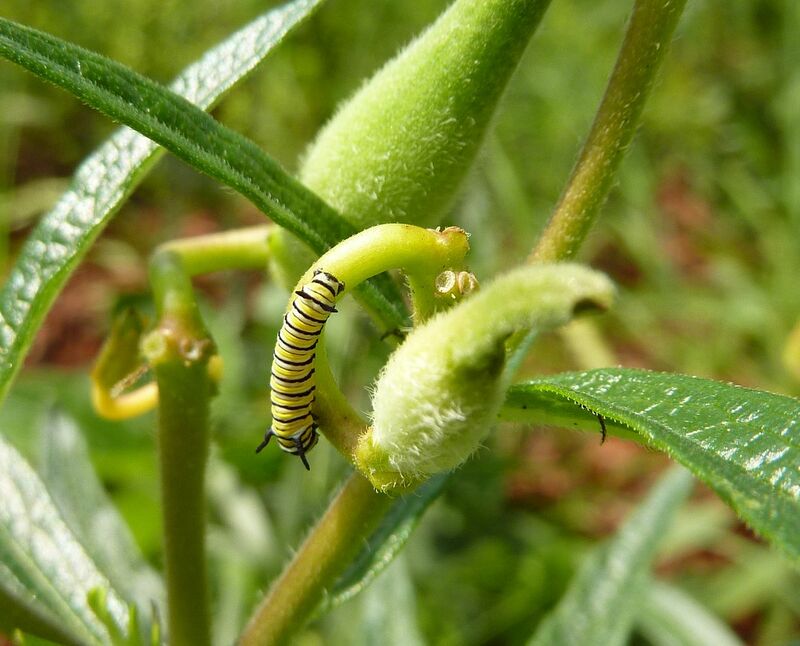 You plant milkweed and you're almost assured to get some caterpillars. And not just any caterpillars, ones that are fearless out in the open nibbling away on host plants in the middle of the day. They're a big middle finger to anything trying to eat them, though I guess the 1 in 25 survival rate makes up for it. 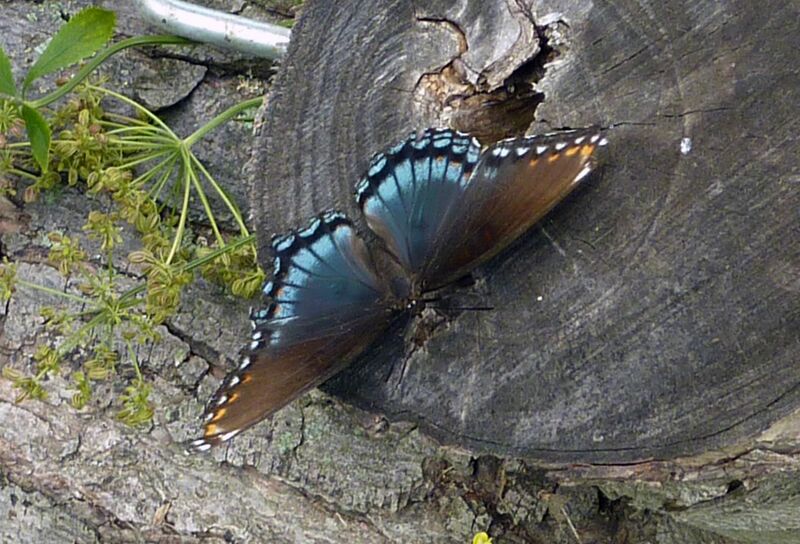 An excellent second species to go for besides the Monarch would be the Pipevine Swallowtail. Because they're poisonous to eat, just like the Monarch, their caterpillars can afford to be out eating during day light hours. Here is a video demonstrating that. Anyhow here's how I did this year. The caterpillar to some kind of Lepidoptera. It might be to a Duskewing skipper or something else. I honestly don't know. 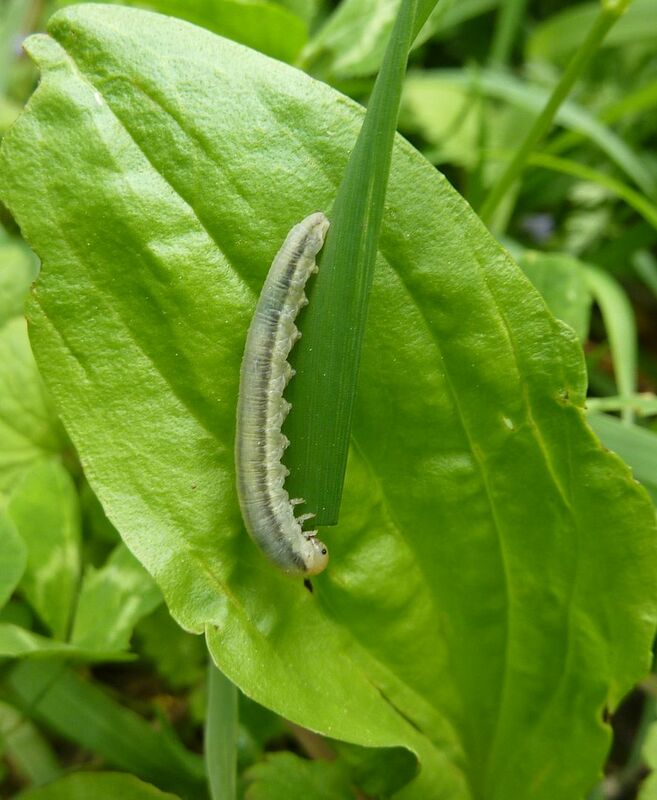 I found it nibbling on some type of small weed that I frankly have never paid any attention to until I found this caterpillar on it. 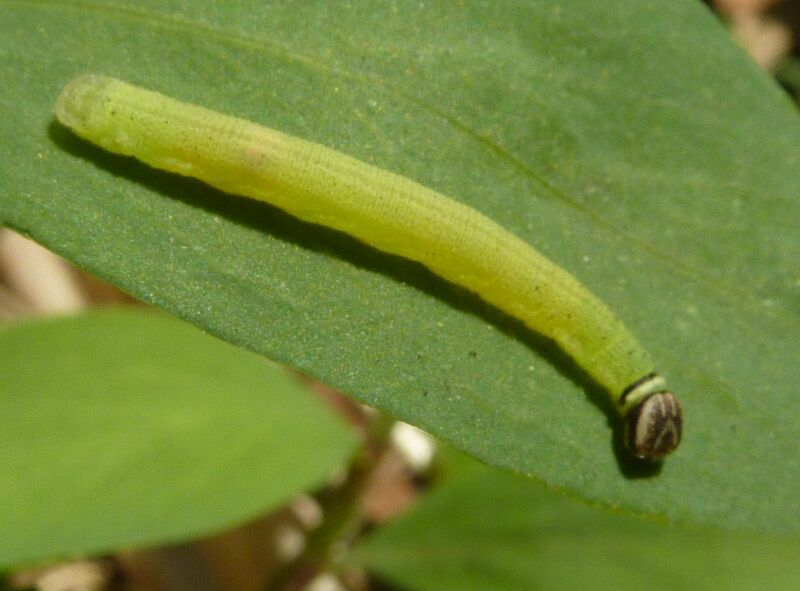 This might be some kind of sawfly larvae or a caterpillar to some moth I've never paid any attention to. What's neat is I learned they all come out at dusk to nibble on a type of grass we have growing all over. And I was a little surprised to find my yard had lots of them munching away. 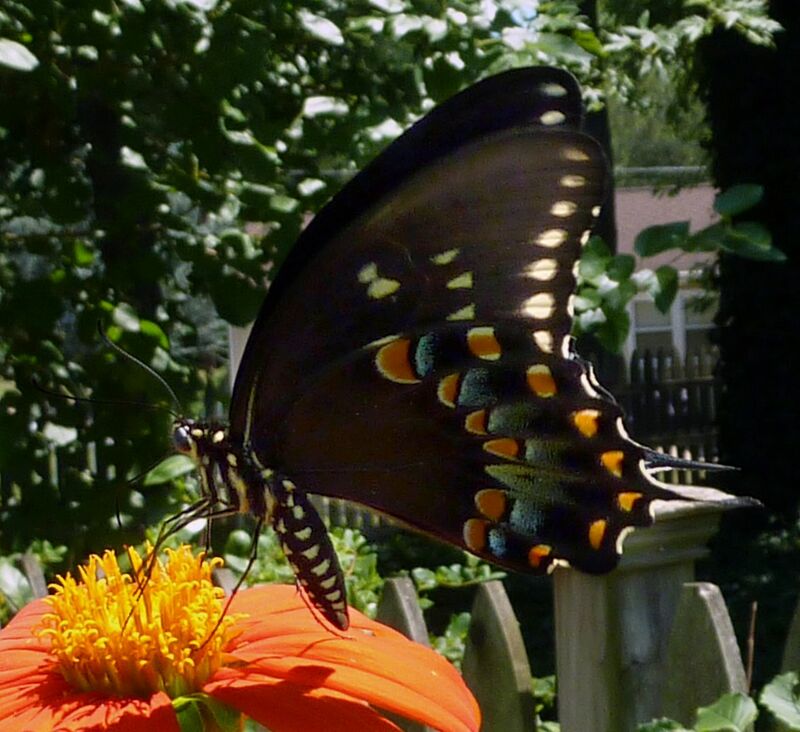 I finally figured out how to tell the Spicebush Swallowtail, Papilio troilus, apart from other Swallowtails. Note the line of large orange spots under the wing. One of the spots is missing and replaced by a blue streak. 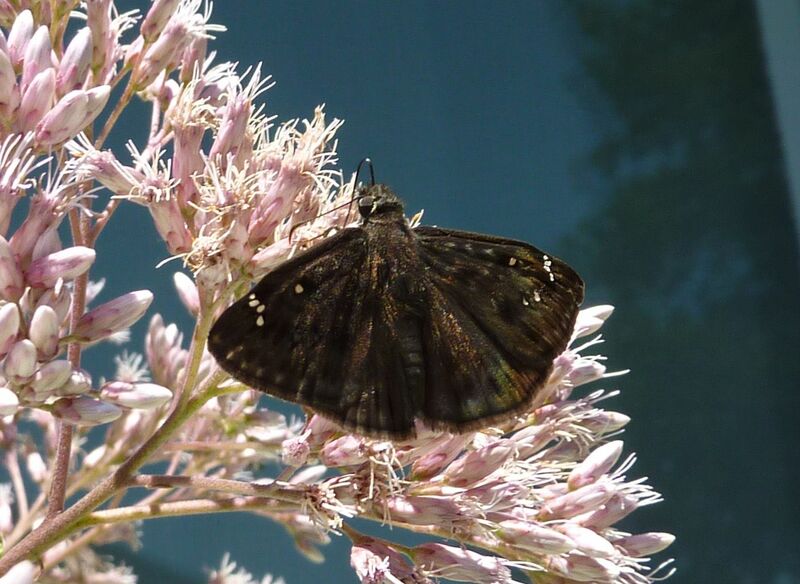 A Duskywing Skipper of some kind. Imperial Moth, Eacles imperial, is I caught several of these this year. I always keep over night then release them immediately. I know how time sensitive their life cycle is. These giant silk and royal moths are about the size of my hand. I even tried rearing them in captivity. Sadly my ability to do this successful is lacking and I've yet to raise one to adults. 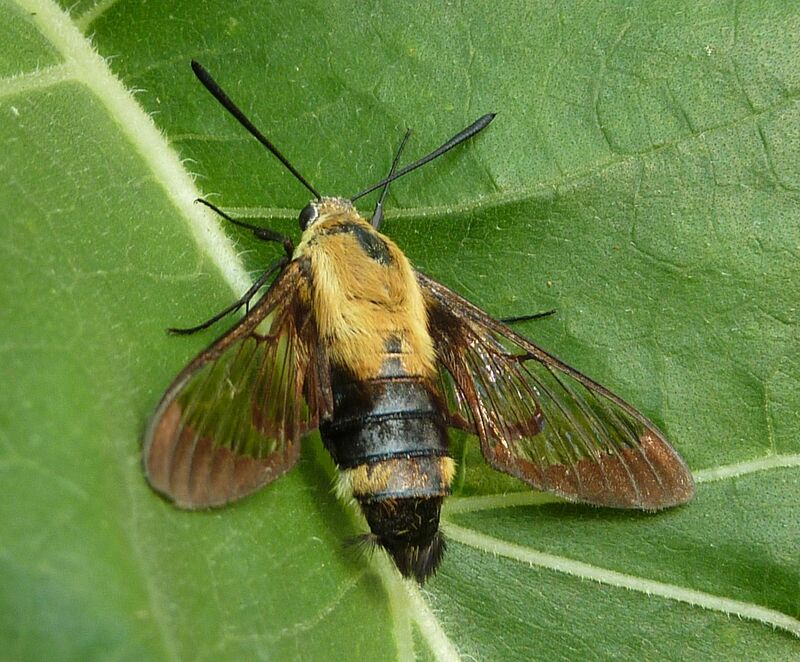 I finally got a Snowberry Clearwing Moth, Hemaris diffinis, to hold still. Our honeysuckle plants were teaming with these. Some type Elf or Blue or something. This group of Lepidoptera I'm not very familiar with. A Cloudless Sulphur, Phoebis sennae. I've been trying my best to make these more common in my yard. There's also a relationship between this species, their host plant, and some ants I hope to someday document. Fritillaries are another group of Butterfly that I'm just starting to learn about. From what I can gather they don't travel that much at all. 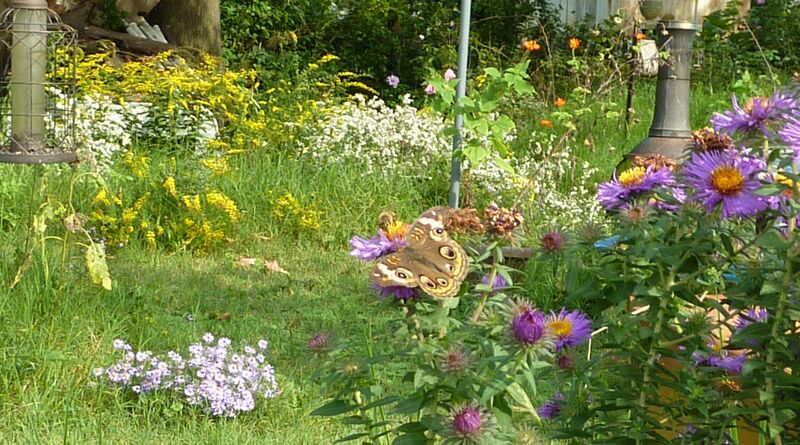 People with these in their gardens should feel honored as many species are restricted to only a few fields and are often considered a mark of quality. A little upside down, but, this is a Red Spotted Purple, Limenitis arthem. And you can see from the smooth curve on the rear wings that it is not swallowtail. It is mimicking a swallowtail as are many other swallowtails, who all strive to look like the Pipevine Swallowtail, Battus philenor. The Eastern Tiger Swallowtail, Papilio glaucus, (and maybe a few others) don't really try to mimic their Pipevine cousin at all. Only 1/3 females are born black, though when the Pipevine Swallowtail is prescient in the area that number can jump much higher. 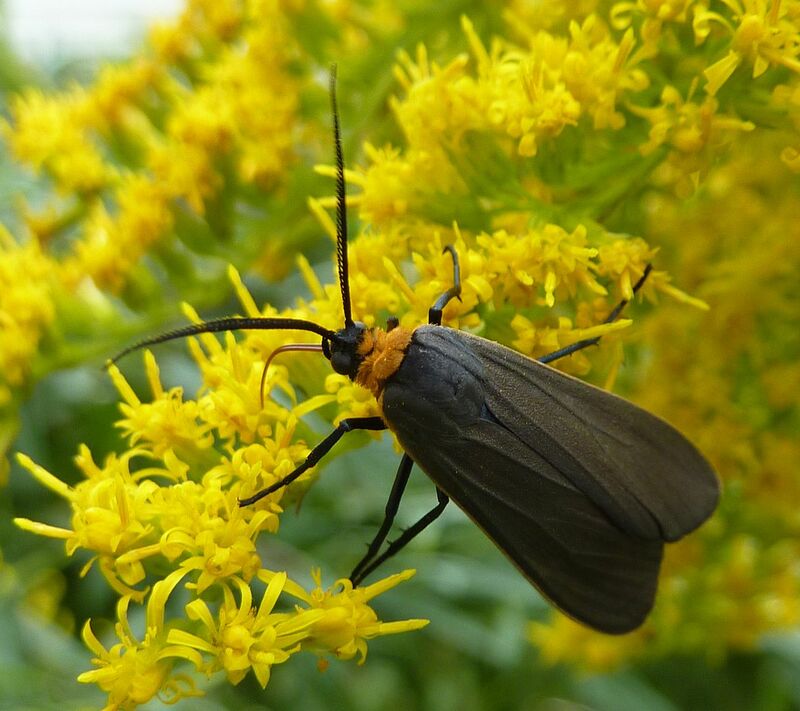 Males for whatever reason are always yellow and seem to proudly patrol from host plant to host plant, typically tall trees in the Cherry, Ash, Tulip and other genera. I'm not sure how they get away with being so showy and not poisonous. Perhaps their size allows them to break this rule, or perhaps the stripes remind birds of cats? 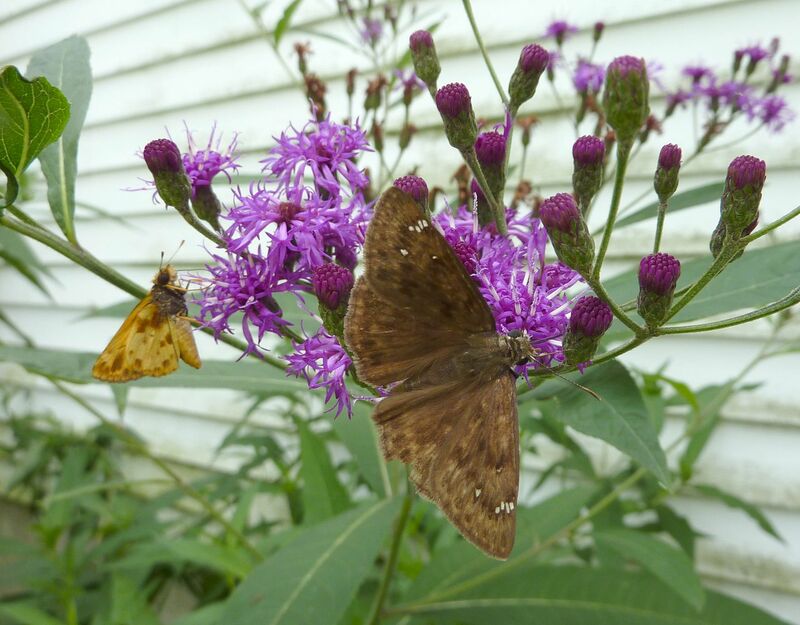 A skipper in back, and a duskywing in front on some Ironweed. 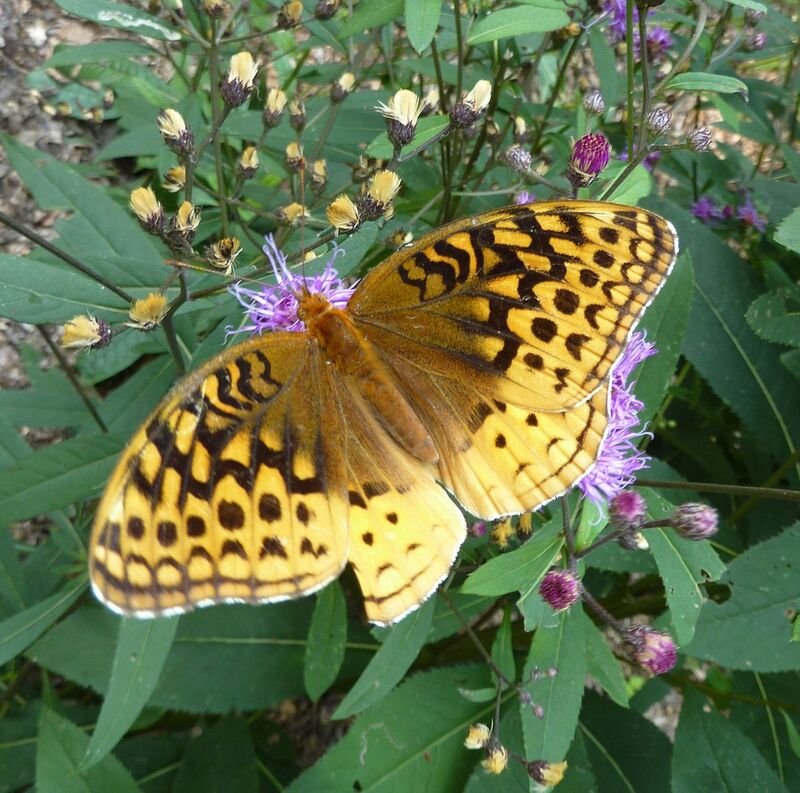 The Great Spangled Fritillary Butterfly, Speyeria cybele, is slightly larger than a Monarch Butterfly. As with other Fritillaries I read that females haphazardly lay eggs each autumn without any real regard for host plants. 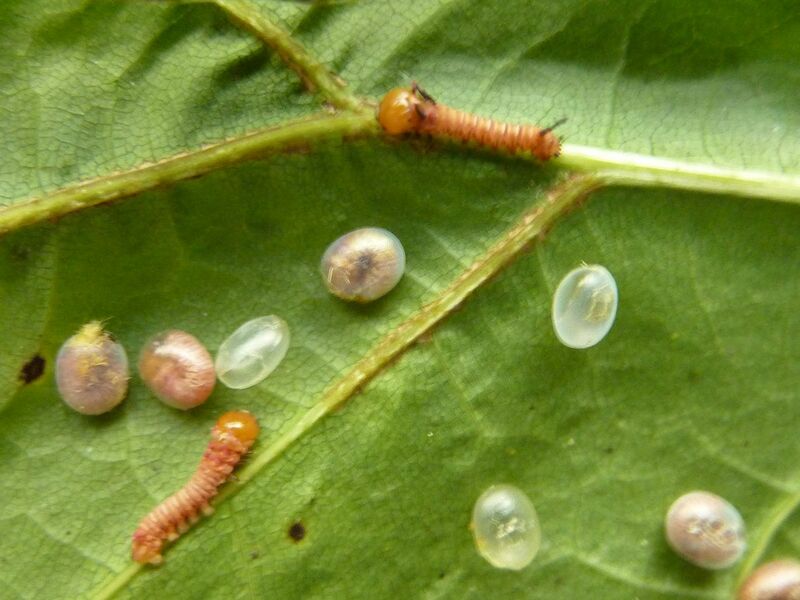 The resulting caterpillars are born and over winter without eating for ~7 months. Their host plants are Violets, which can be very common thankfully. 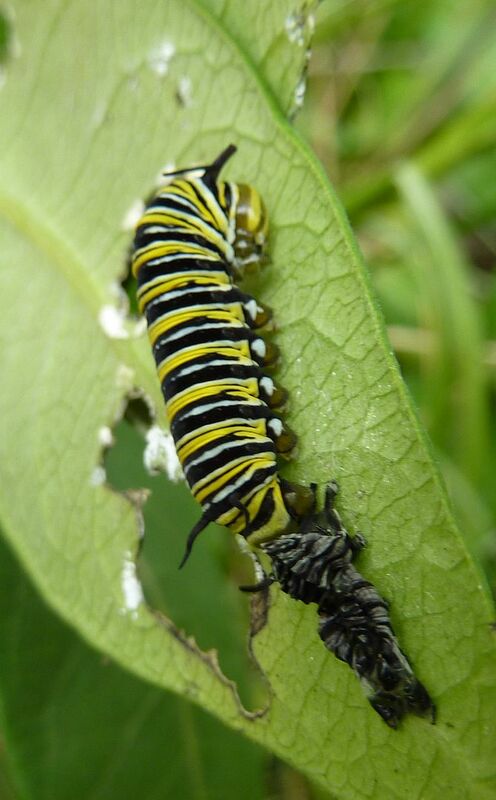 Caterpillars that are successful at staying alive will develop quite an appetite and eat two whole plants everyday. 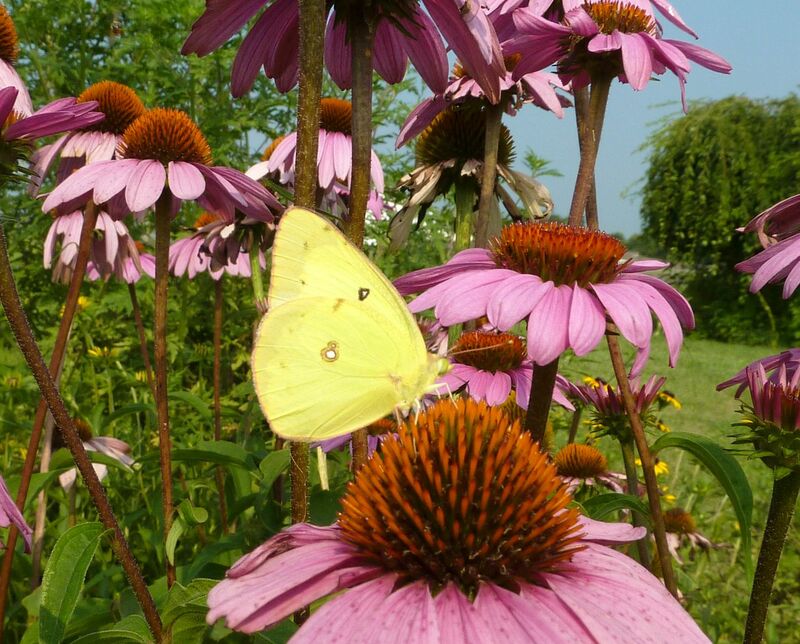 Butterfly season comes to its close here in August as the Monarchs start their migration south. Danaus plexippus. This year I raised several caterpillars in captivity and made a video of the process. You may look but don't eat. 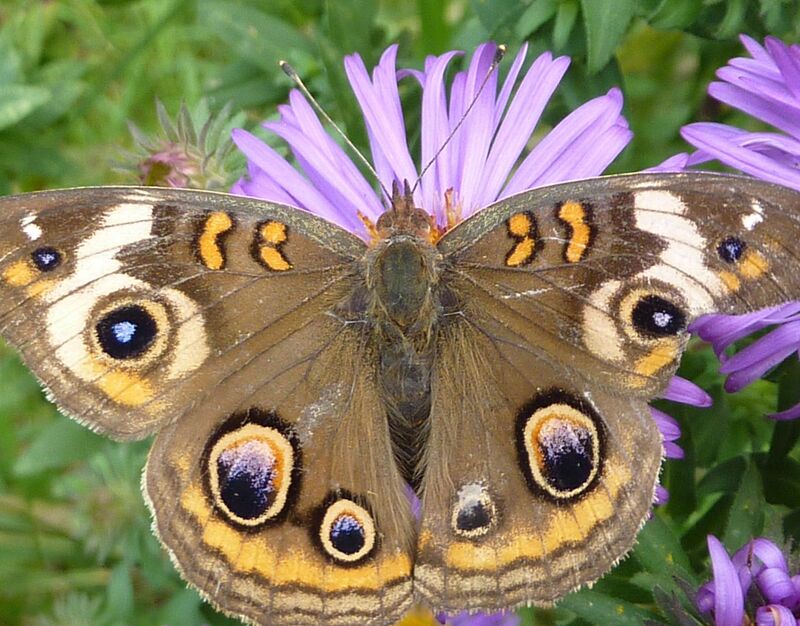 Another migration happening at the same time is that of the Common Buckeye, Junonia coenia. The last of the Lepidoptera for the year was this Yellow-Collared Scape Moth, Cisseps fulvicollis. Not a bad way to end the year at all.